A short introduction: I am 61 years old. Running has been my speed of life since I was fourteen. I ran cross-country in high school, and continued with two-to-three mile daily runs for more than four decades. I’ve done group runs after work and on weekends. I find my joy on breathtaking beach runs. Over the years I’ve enjoyed fun runs like The Color Run, and the scenic four-mile run in San Diego over the Coronado Bridge. My favorite races are the Carlsbad 5K, billed as “fast and flat,” where I once medaled in my age group, and the Seafair Parade 10K in Seattle, where you run along the parade route before the actual parade begins with people cheering you the whole way. After ramping up my distance training in my 40’s, I completed the La Jolla Half Marathon two years in a row. That was a big accomplishment! I remember icing my knees with a cold beer stein after finishing! In my 50’s I returned to running two-to-three mile distances for the cardio benefits, the endorphins, and to maintain my overall health. For all my lifelong fitness, however, I haven’t been able to outrun cancer. It first showed up in 2008, when a primary tumor was located in my small intestine. It was removed and my doctor identified it as NET Cancer. For the next six years, my six-month scans were all NED (no evidence of disease). 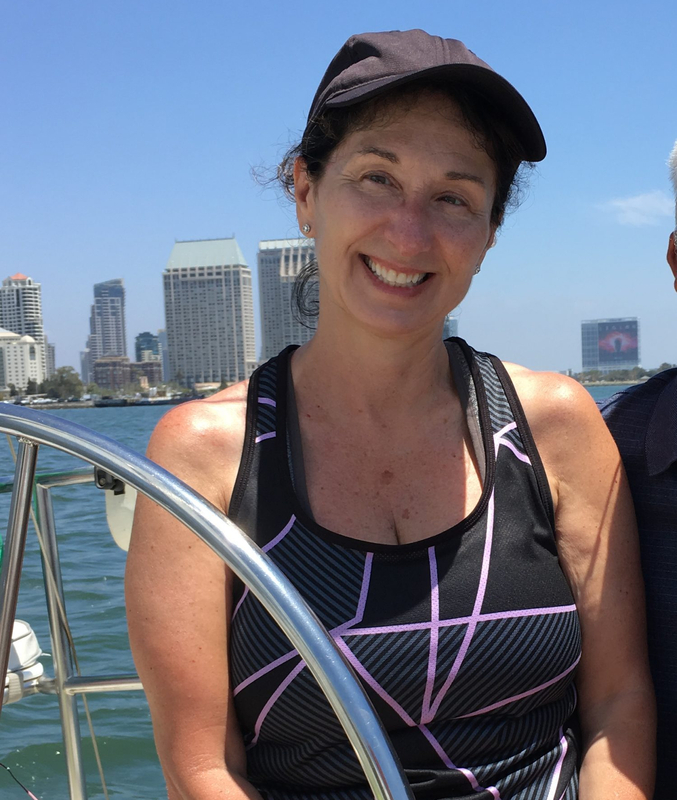 In 2014, spots appeared for the first time in my liver, and I started receiving monthly shots of Sandostatin LAR (my miracle NET Cancer maintenance treatment) to keep me symptom-free as long as possible. I call these shots my “Chemo-to-go.” With this simple shot every month, I have been able to keep working and enjoying life as before. Last year in August, my NET Cancer specialist and his team at Cedars-Sinai Medical Center were continuing to observe a dozen NET tumors that had accumulated in my liver. They had been growing slowly over the past three years and it was becoming painful when I breathed in, as my enlarged liver was pressing on my diaphragm. At that time, I decided to retire from my full-time career in marketing communications. It wasn’t an easy decision but it was important to take time to prepare for major surgery ahead. My oncologist said by successfully removing all the tumors, my liver would regenerate and I would likely continue with a high quality of life going forward for several decades more. NET Cancer cannot be cured. It is a rare cancer, and it does recur over time. Fortunately, with tumor management treatments available today, progression can be slowed down and regular life can continue for many NET Cancer patients for many years. I may never be able to outrun my NET Cancer, but I love my newest return to 20-30 minutes of leg-pumping, heart-racing, outdoor moving meditation, running forward to my future, just as before. For anyone who is a cancer survivor, I encourage you to get outdoors every day. Do whatever you can do… take a walk at the beach or to the park. Visit the public gardens in your area and enjoy the flowers in bloom. If you live near water, go for a boat ride and feel the wind in your face. Or find a comfy chair on your porch or in your backyard and close your eyes for a few minutes of sunshine. Strive to be an outdoors person in some way every day, if possible. There are cancer fitness programs in many areas too, with walking friendship groups for those that are able. For anyone who knows a cancer survivor, invite them to experience the great outdoors with you. Camping, sailing, a stroll in your area’s botanical garden, a picnic by a lake, lunch by the ocean, a day at the local zoo. If you have active friends fighting cancer, ask if you can sponsor them with a small donation to any fund-raising activities they support. This means so much! As far as running, I feel like a perennial flower in the garden… Blooming again every year. It feels so good to be back! and has received 500+ social shares in 48 hours. Meetups are the most “fertile farms” around! More and more Realtors I know are having epic problems with their tried and true farming efforts. The recurring problem is smaller and smaller “crops” every year. Want to create new, super-fertile farms? Use Meetup.com and it will blow up your farm (and I mean that in the best way possible)! 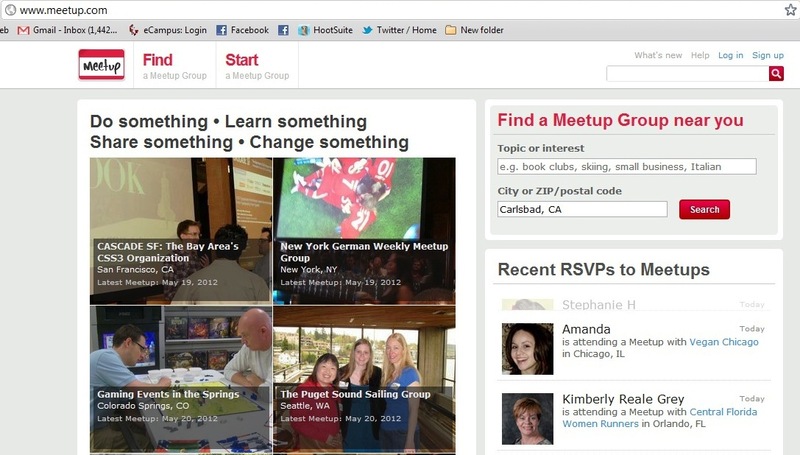 Below is a screenshot of what the Meetup.com site looks like. At the very top-left, you will see two red buttons: Find a Meetup and Start a Meetup. The four windowpanes above are rotating photos from Meetups all across the country. You can see the Cascade CSS (Tech) Meetup in the Bay Area, a Meetup in New York for practicing your German language skills, Gaming events in Colorado Springs area, and the Puget Sound Sailing Meetup Group in Seattle, Washington. That’s a pretty broad representation of what you’ll find on this site. I believe that Meetup.com has something for everyone, so let’s take a deeper dive. Look above one more time, on the right side and you’ll find a box to Find a Meetup Group near you. Go ahead and see what happens when you type in a topic or interest, and your zip code. 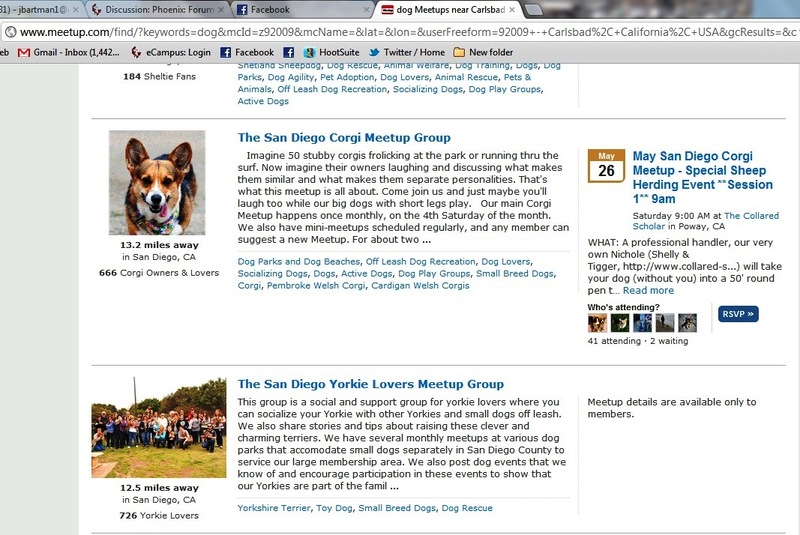 Below you see my results: two great Meetup.com groups 10-12 miles away from me. Wow! You can see the San Diego Surfing Moms have 95 members. They meet weekly for surfing and socializing, with built in shared childcare while they hit the waves. 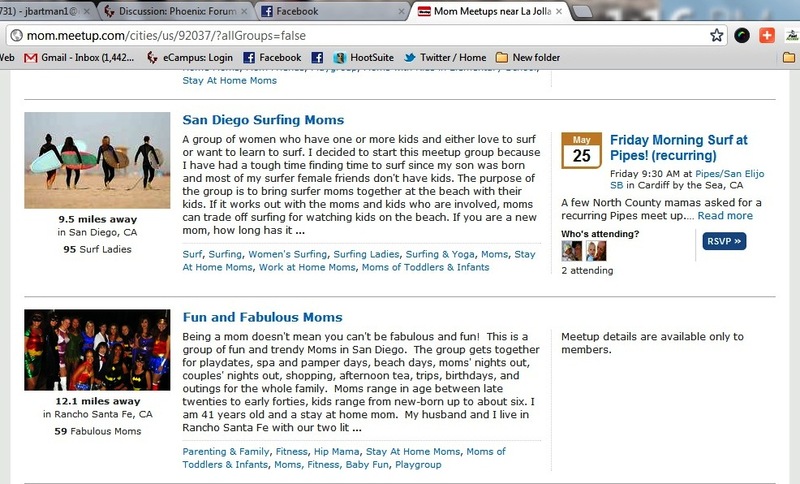 Join the one below Surfing Moms and you’ll find yourself among 60 other self-proclaimed “Fun and Fabulous Moms” who do all kinds of fun activities listed in their description above. I already love their enthusiasm and group energy! Are you passionate about causes, but feeling lost about where to start? 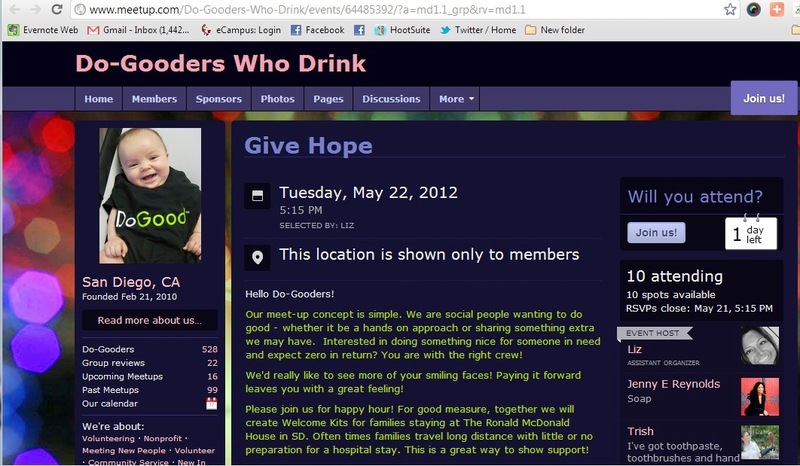 I joined my favorite Meetup group because of the group title: “DoGooders who Drink.” Their mission is best shown right on their group page, below. 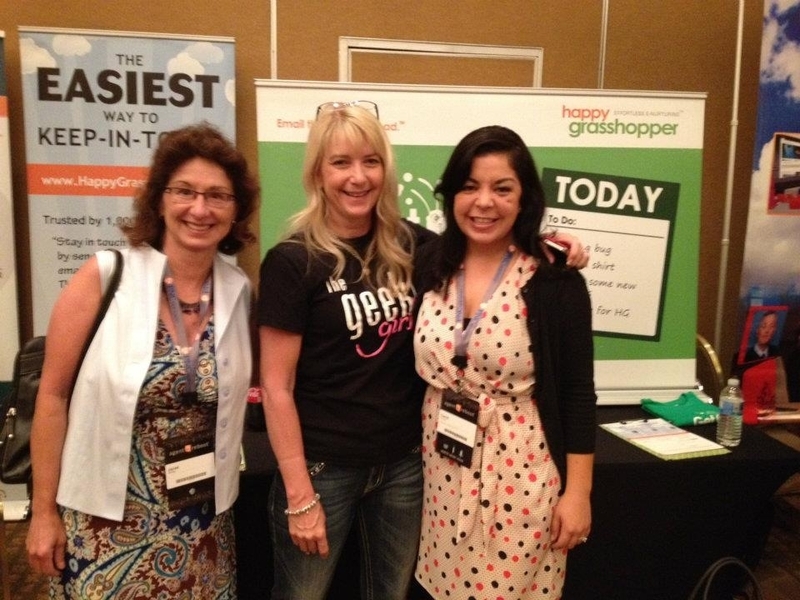 Fellow “DoGooders” include over 500 members. This group is very diverse. All ages, all professions. A nice-sized number of us gather a couple times a month for lunch, brunch, or happy hour, and we include simple tasks like everyone bringing five stamped postcards to write and mail to U.S. servicemen and servicewomen stationed overseas. (Shhhh! They’ll never know we have cocktails in hand while we write, unless we tell them.) This month the DoGooders are collecting simple care items and making “Welcome Kits” for families staying with children at San Diego’s Ronald McDonald house. 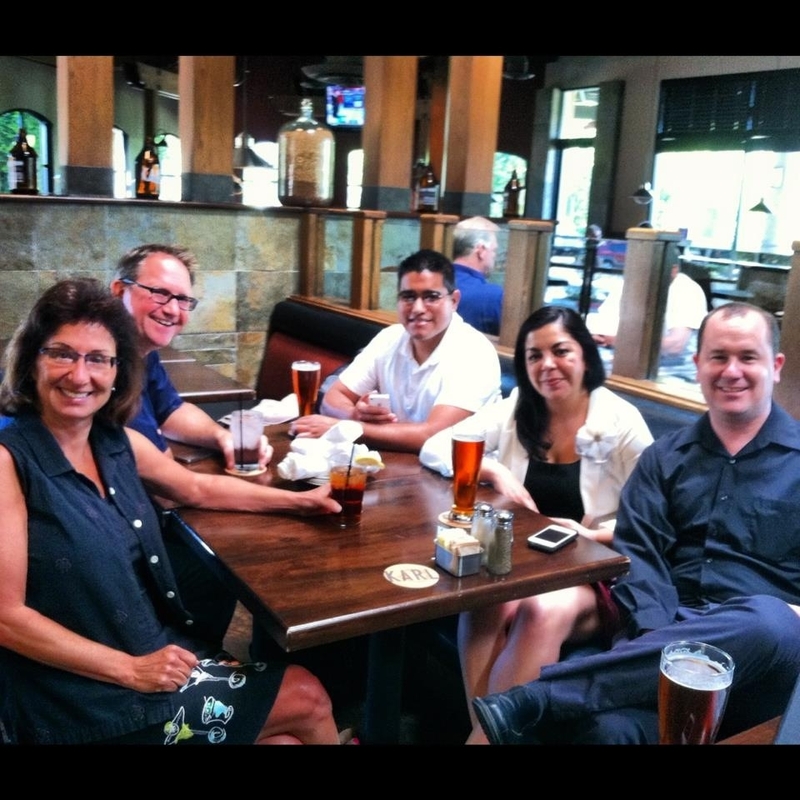 Whether you are in a major metropolitan area, or a small city like Spokane, WA where I recently lived (I was the Communications Director at the Spokane Association of Realtors), you will find Meetups to build your contact sphere naturally with interests you share with others. Below is the results page after I searched “Sports” and a Spokane zip code. You’ll see two outing and adventure excursion Meetup groups for Spokane County and Kootenai County residents with over 1,000 members between them! Look to the right and you’ll see exciting Jet Boat trips on the Snake River, and Volleyball events coming up in the next few weeks. Want to know about what’s trending on Meetup? 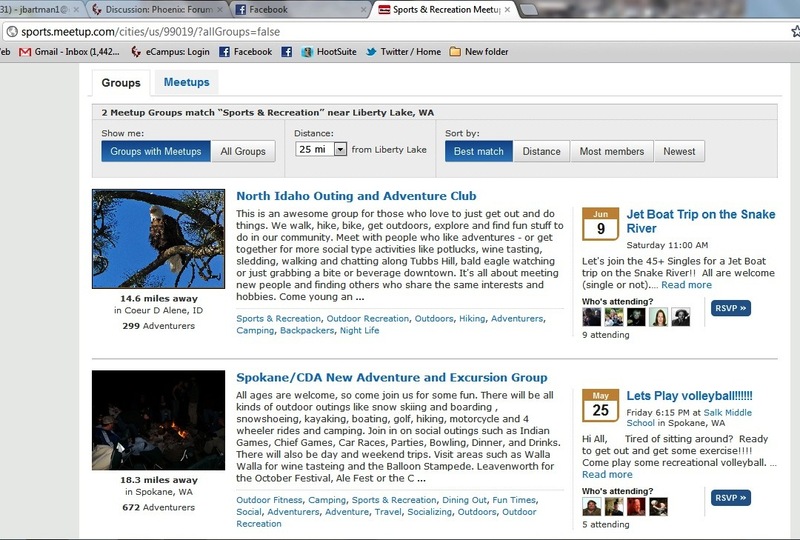 Just click “Find a Meetup” at the top and type in your zip code. Here are my results, below. You can see that I have four great choices… Hiking, wine-tasting, meeting some exceptional entrepreneurs, or talking personal finance. 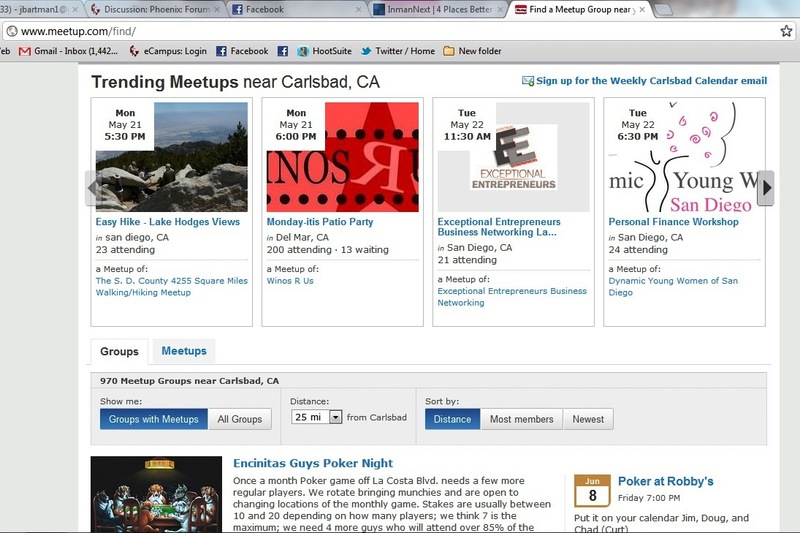 Just above in the light blue box, you can see that there are 970 Meetup groups near me in my town of Carlsbad, CA. Look again, near the bottom. Did someone say “Poker?” Can you see “Encinitas Guys Poker Night” at Robby’s in the picture? Farming can be a whole new and energized experience on Meetup, so go ahead and blow up your farm — in a good way! You know how to do that now, using Meetup.com. 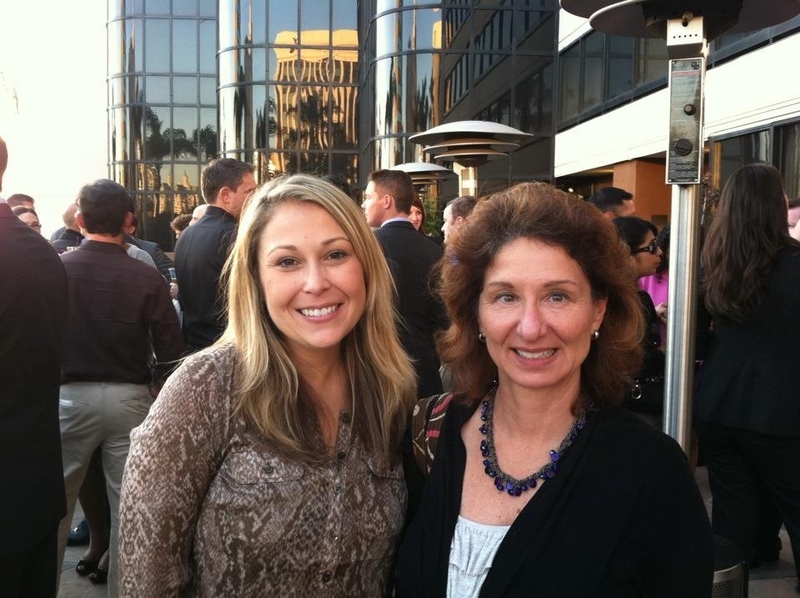 Janet White is a skilled communications and social media director in the real estate industry. 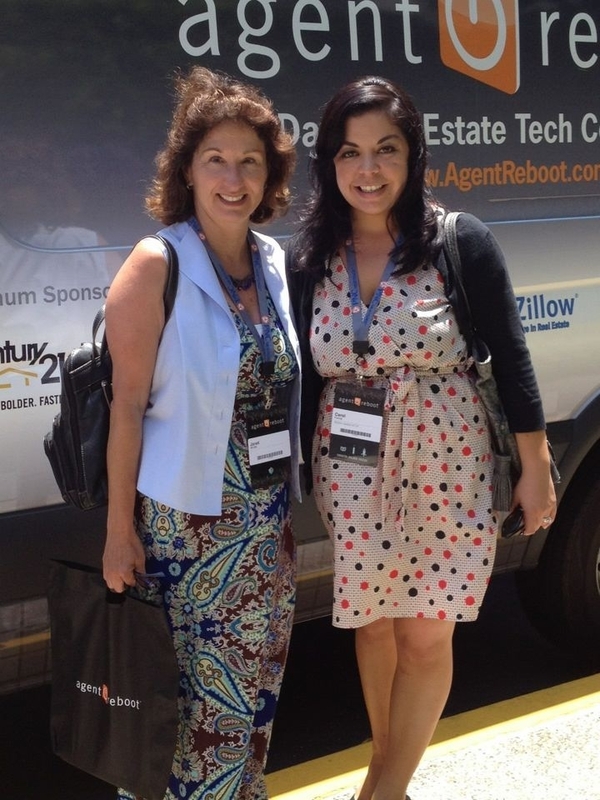 She is passionate about helping Realtors succeed in their business and hopes to join a company in the Greater San Diego real estate community. Follow this blog at www.iSocialimpressions.com, or view her experience on LinkedIn: www.linkedin.com/in/JanetWhite1. Can you pass the “Concierge” test? 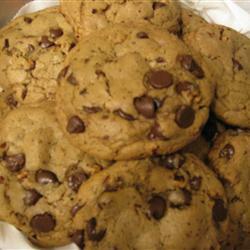 “Mouth watering chocolate chip cookies! Recently I was traveling, and I was staying at a familiar business-class hotel. Each afternoon, the hotel baker brought a large, irresistible tray of freshly baked cookies like these to the concierge desk. When I returned to the lobby at the end of my workday, I walked up and selected a cookie. As I did, I made the comment that I had been looking forward to this special treat all day. What happened next really surprised me. The concierge just glanced up, gave me a cursory nod and a brisk “no problem,” and then his eyes reverted back to his computer screen. All that effort by the company into baking fresh cookies, and the goodwill was gone in an instant. This concierge was unconscious, and THAT was a problem. Are you unconscious in your communication with clients? I am on a personal mission to wipe out the phrase ‘no problem’ from the service industry. If there is no problem, don’t bring one up.